The K1, K2 and 1st graders at the Eliot had an Art Show so they could show off all of their art projects. They learned about quite a few famous artists and different techniques. The kids and teachers were so proud that they really went all out for this event. They decorated the hallway, played music and collected an entrance fee for future field trips. It is always fun to see the kids so proud of themselves and each other. Another great part of the day was having Babci there! On Richie's actual birthday we went outside to play in the snow that we FINALLY got this winter. No, it wasn't a lot, but the kids don't really remember having much more than this so they had a blast. Snow angels, snow men, throwing snow balls to Regina and just being silly should all be a part of winter but it hasn't been so far. We finished this special day with a Lulu's cupcake for our last celebration. I can't believe my baby is five. He has already grown to be such an amazingly warm, kindhearted, hysterical boy and I couldn't be more proud of him. I love you stinker pants! Although Rich wanted another (would have been the third year!) 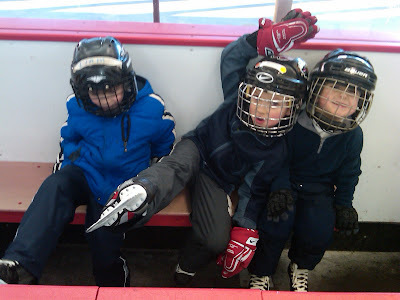 birthday party at our ice rink, we wanted to do something different (aka a little smaller). I think we came up with the perfect compromise. We took Richie, some family and two good friends to a Northeastern Huskies hockey game. We had already been to one of their games (with Colton) so we are already all Huskies fans. We took the T over there since Jakie and Joshie LOVE trains. Then some pizza and a Batman cake before the fun game. We had a whole section to ourselves so we could hang out with our guests and cheer on the Huskies. Then to top off the night, Richie's birthday was announced over the loud speaker AND they put it up on the Jumbotron! I am so glad I got a picture of it. Pretty exciting for a hockey loving five year old! Happy Birthday to my big man!! And the birthday weekend begins! Not sure why, but my kids seem to celebrate for days on end. To be a kid again.....The first thing we did was hit the Aquarium with Jakie and Joshie. All Richie really wanted for his birthday was for those two boys to visit. It was so exciting because we also had one of the first real snow storms of the year. Perfect way to keep the crowds out and to make the walk there even more fun. Although Dawn now watches Sawyer and Chase, she still makes time for my kids. 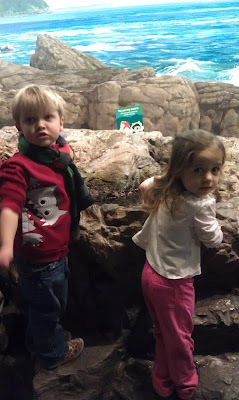 Today she picked up Angela and took her with the boys to the Aquarium. What a nice surprise. Guess who is potty trained! It was a LONG, hard weekend (and you can see how much time we spent in the potty) but she did it. She got cupcakes and lots of treats because we are so proud of her. There is nothing better than to be done with diapers. Chris took the diaper pail on a ceremonious trip to the trash! Nothing better than some fresh squeezed orange juice! Thanks to Grandpa and Nana Sheila we get a box of oranges from Florida every winter. After picking the perfect ones to eat we squeeze the rest for juice. And this year we saved some of that amazing juice for our new ice pop makers that Santa gave us. The best juice and ice pops around. Some pictures and videos from Dawn. She was cleaning out her phone and camera and came across these doozies! Were my kids ever really this young? Richie is lucky because the Skate Shop owner at our ice rink also has a kid at The Eliot. This means that every Tuesday a couple of classes get to go skating. Here is Liam, Travis and Rich horsing around on the bench. I didn't get to go, but Chris did. They need lots of hands for tying skates, etc. I guess a lot of the kids had parents there to help. The high parent participation level is one of the reasons we LOVE his school and our neighborhood. It has been nice for Chris and I to hop home for school events since we work so close.